Let us take the time to remember, thank, and praise Dhan Dhan Sri Guru Gobind Singh Ji Maharaj, who gave up everything for the Khalsa. Please help spread the word to your family, Sangat and others to come and join the Sangat at this program. The entire program will be broadcast live here. 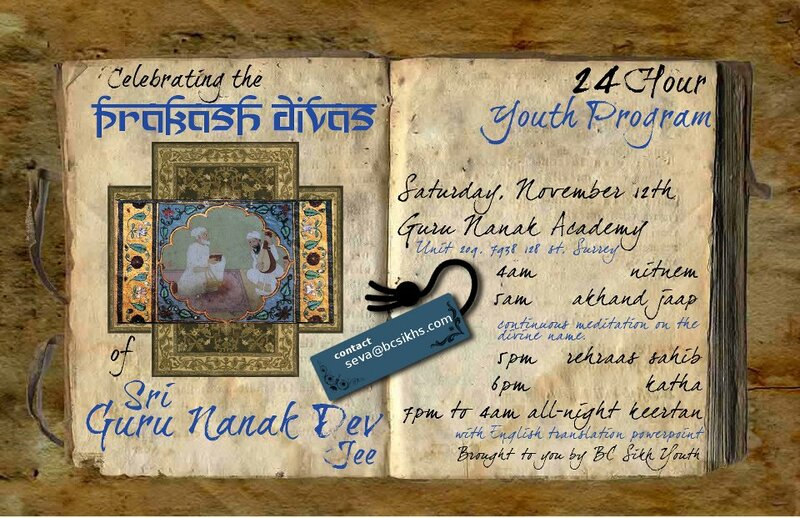 Join us on November 12, 2011 as we celebrate the Prakash Divas of Sahib Sri Guru Nanak Dev Ji. The program starts at Amrit Vela with Nitnem followed by a 12 Our Akhand Jaap of Gurmantar. In the evening, there will be English Katha following by a Rainsabayee Keertan organized by the sevadars of the BC Sikh Youth. Click the poster below for details. Join us on July 23th for the second part of an informative and interesting workshop about the Punjabi Language and Gurmukhi script. Having attended the first part will be beneficial, though is not mandatory for attending the second part. 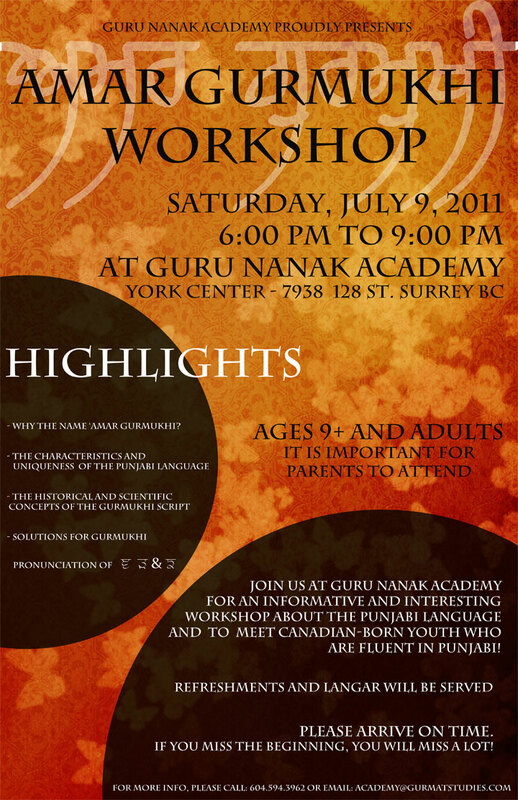 Join us on July 9th for an informative and interesting workshop about the Punjabi Language and Gurmukhi script. Due to the poor weather conditions, the BC Sikh Sangat Picnic that was planned for today has been postponed to a future date. The weekly Saturday Night program will continue at its regularly scheduled time tonight. Let us take the time to remember, thank, and praise Dhan Dhan Sri Guru Gobind Singh Ji Maharaj, who gave up everything for the Khalsa. Please help spread the word to your family, Sangat and others to come and join the Sangat at these programs. The entire program will be broadcast live (audio and video) here. 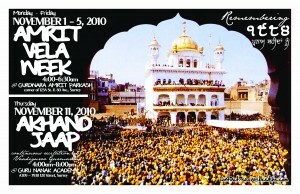 Join us on Nov 20, 2010 as we celebrate the Prakash of Sri Guru Nanak Dev Ji. The program begins at Amrit Vela with Prakash of Sri Guru Granth Sahib Ji at 4:30am followed by Nitnem and Sri Asaa Di Vaar and continues throughout the day with a Sri Jap Ji Sahib Akhand Jaap. In the evening, Guru Nanak Dev Ji’s praises will be sung from Bhatan de Swaiye, along with excerpts form Bhai Gurdas Ji’s Vaaran. After English Katha, there will be a Keertan Darbar until 11pm. The program will be concluded with the English Katha of Sri Guru Nanak Dev Ji’s Avtaar from Sri Nanak Prakash by Kavi Santokh Singh. The sangat is humbly requested to stay until the end of the program to participate in a unique celebration of Guru Ji’s Prakash at midnight, followed by Ardaas. 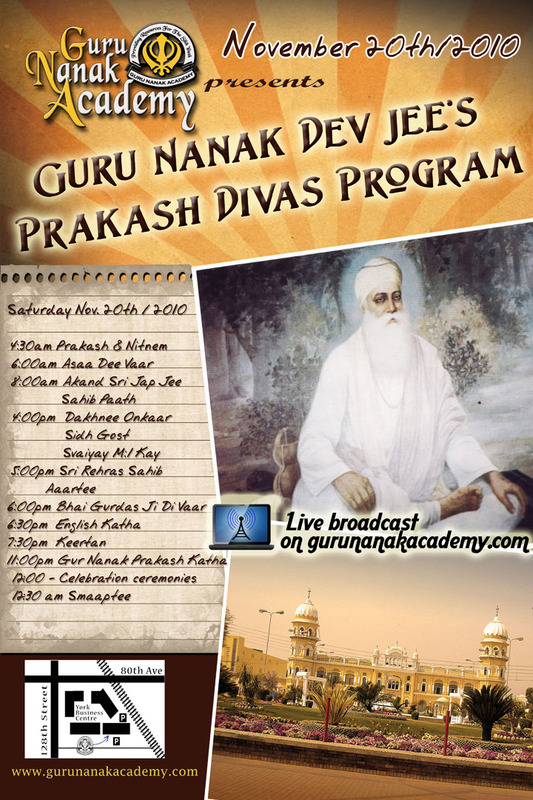 The entire program from Sri Asaa Di Vaar until Samaptee will be broadcast live (audio and video) here. 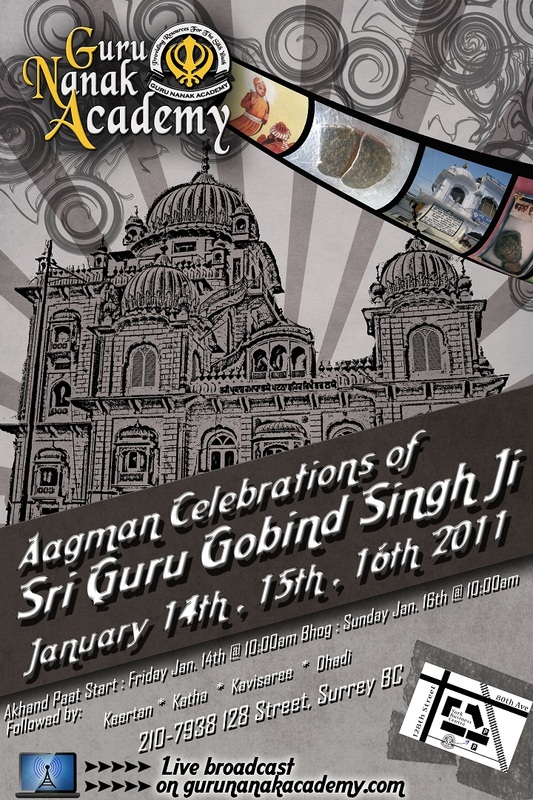 All of the sangat is invited to Amrit Vela Week & Akhand Jaap. 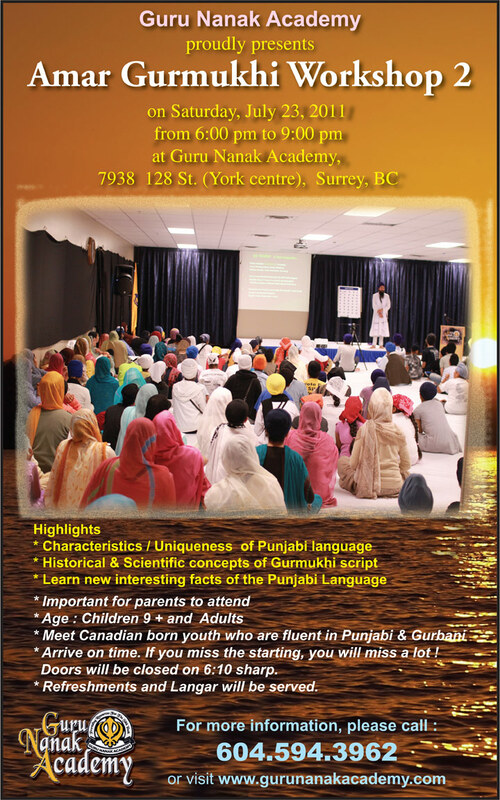 Amrit Vela week will take place at Gurdwara Sahib Amrit Parkash, 123A Street & 80th Avenue, Surrey. There will be daily simran & nitnem, from 4-6:30am, by the local Sikh youth, from Monday Nov.1 to Friday Nov. 5. 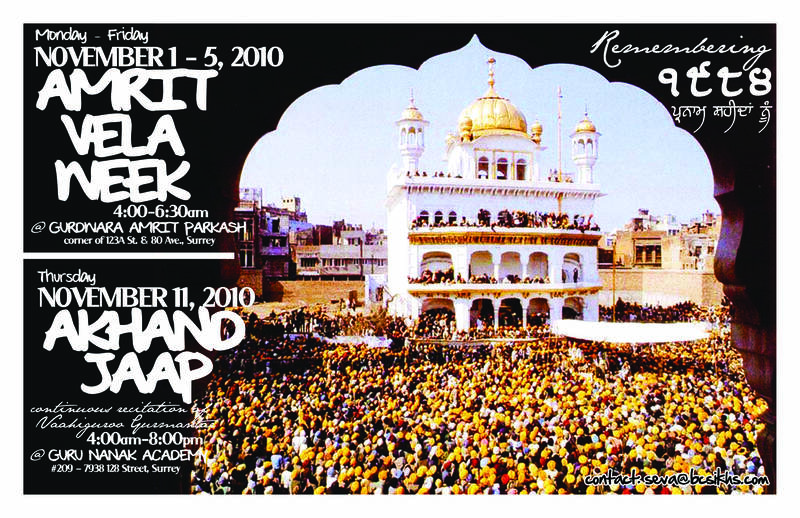 Akhand Jaap will take place at Guru Nanak Academy on November 11th from 4am to 9pm. 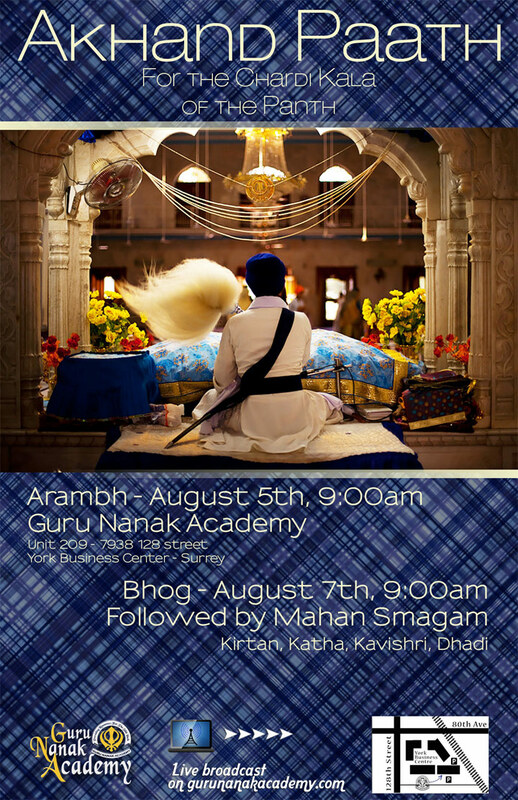 The program will consist of Nitnem, 12 hours continuous “Waheguru” simran meditation, and an evening keertan program.